The egronomics on the knife are awesome. It's overall design is great and it is a beautiful knife. Thank you Spartan, Mark, Curtis, Harsey, Kimberly and everyone else involved in your company and hope to buy more wonderful knives from you soon. 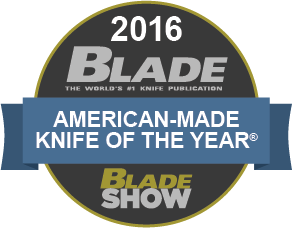 See you at the plaza Cutlery Knife show in Oct. This knife is very well designed and made. Pure quality. the Spartan Harsey Folder has really exceeded my expectations. I have waited years for Mr Harsey to come out with a titanium folder. Then I had to wait a few extra months as the manufacturing process was tuned up at Spartan. In the end., it was well worth the wait. The folder is a beautiful work of art and a functional clean sharp edged tool. I elected to buy the DLC coated version. The craftsmanship fit and function are all superb. I have only had it as my daily carry for a couple of weeks but it is breaking in nicely. It's got some heft to it and feels very secure in your hand. But not too heavy in the pocket. I'm not sure how they crammed that 4 inch blade into that folder but it works well. The blade is retained securely within the grip when in your pocket but deploys easily and quickly when needed. The thumb indent, thumb tabs, bearing surfaces all work well together and compliment the knife. Yes, it's expensive. But I find it's worth it. When it comes to Bill Harsey, the name of the blade says it all! We at Spartan Blades are proud to offer the Spartan Harsey Folder (SHF), a high quality, custom, handcrafted folding knife designed by acclaimed knife maker William W. Harsey Jr. This is the knife that you’ve been waiting for! The Spartan Harsey Folding Knife is comprised of a highly reliable and durable frame lock design. Aside from the knife’s pivot, blade, and stop pin, this folding knife is made from 100% 6AL-4V titanium. Our Spartan Harsey Folding Knife is coated in DLC, or Diamond-Like Carbon coating, for maximum strength and durability. This is one of the best folding knives available anywhere! This high quality, hand crafted folding knife features a reversible pocket clip and dual thumb studs, making it perfect for both right-handed and left-handed knife enthusiasts. If you’re looking for an artisan handmade folding knife that will last a lifetime, you’ve found it in the Spartan Harsey Folder!